I am not a trained chef or baker. I haven’t been to years of culinary school or presented with major awards (though I did win a cooking contest I entered for this panko crusted chicken with lemon cream sauce), but I still make some pretty awesome food and sometimes it turns out so good I feel like it must have been luck. In fact, I tested this one again and ate so very slowly just to think about the flavor and texture perfectly to assure it really was as awesome as I thought. And you know what? 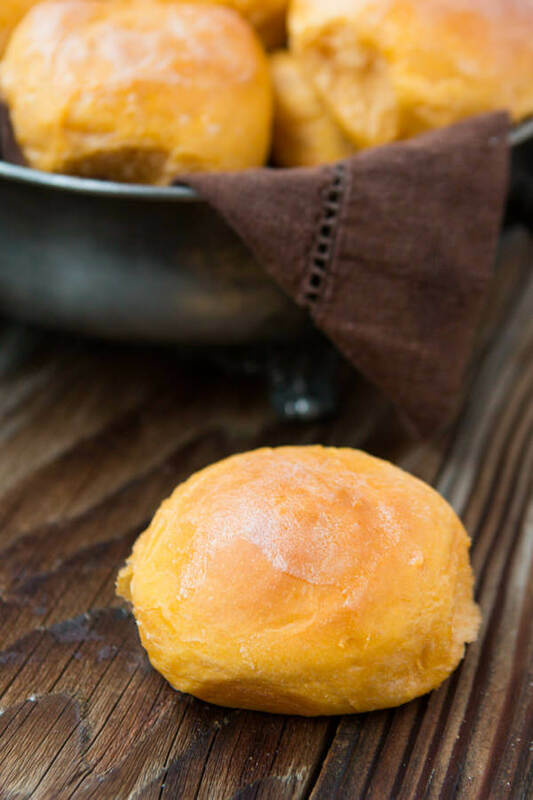 These homemade sweet potato rolls are more than awesome, they may be my new favorite. First, scalded milk. Always scald your milk. It allows for a fluffier rise and dough. And number two? Well that’s easy, practice makes perfect. And I don’t just mean looks. Practicing bread making only gets you better and better at making the stuff. But these rolls? You really don’t “knead” to do much at all. Ha! I’m so funny. But really, I don’t knead them at all and they are so light and airy and the flavor is just fantastic. Plus they look beautiful which is always a crowd pleaser. K, now that I’ve rambled enough, pin this sucker and those other recipes which I’ll link to at the bottom and get baking. I expect lots of good comments about how much you love these! And in case you want to learn a fool proof way to shape your rolls, just watch this video. Yes, yams are actually sweet potatoes. Most people think that the orange sweet potato is a “yam”, and different than “sweet potatoes”. Sweet potatoes come in several varieties, white, yellow, orange and purple, but, they are all sweet potatoes. Yes, the best way to freeze bread or roll dough is to let it rise, shape the dough into loaves or rolls, and freeze. Place the shaped dough on a cookie sheet, (make sure to leave space between the rolls or loaves) and freeze. Once frozen, transfer to freezer bags and store in the freezer for up to 3 months. Rolls can be reheated in the oven. 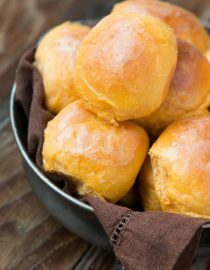 Place rolls in a baking dish and brush with melted butter, cover with foil and bake until warm. 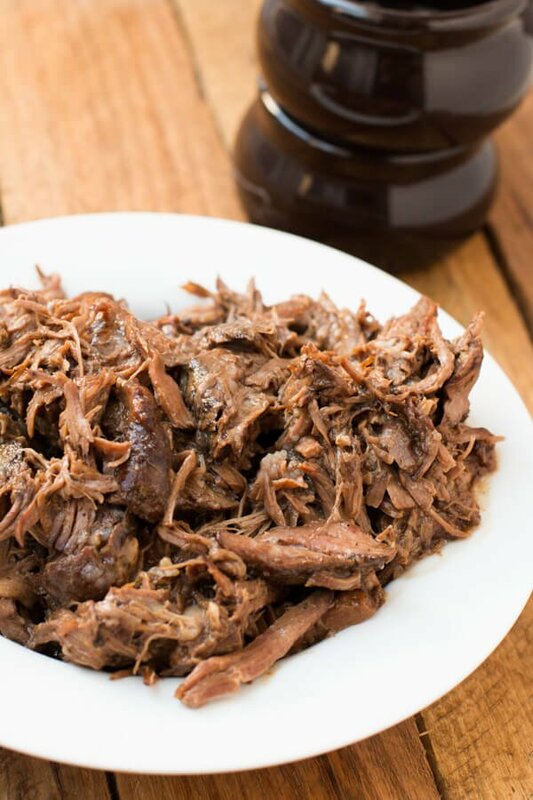 The slow cooker is a brilliant way to reheat rolls. Put a kitchen towel in the slow cooker, and place the rolls inside. You can also reheat rolls in the microwave. Arrange rolls on a microwave-safe plate. In a glass measuring cup, microwave the milk for 90 seconds, but do not allow to boil. Remove from microwave and add the butter to the milk. Stir to combine and allow the butter to completely melt. Once it is warm but not hot, add the sugar and yeast and set aside. In the bowl of a standing mixer, add the flour, salt, vital wheat gluten on the opposite side of the bowl as the salt, and mix with a paddle attachment or stir by hand. Add the yeast mixture, sweet potato and egg. Mix again just until the dough comes together and then switch to the dough hook and mix for 90 seconds. Drape a light towel or saran wrap over the bowl and allow to rise for 1-2 hours. Sprinkle the counter lightly with flour and turn the very soft dough out. Sprinkle the top with a little more flour and roll out to about 1/4″ thick rectangle. Starting at the end closest to you, pinch the dough closed and tightly roll into a log. 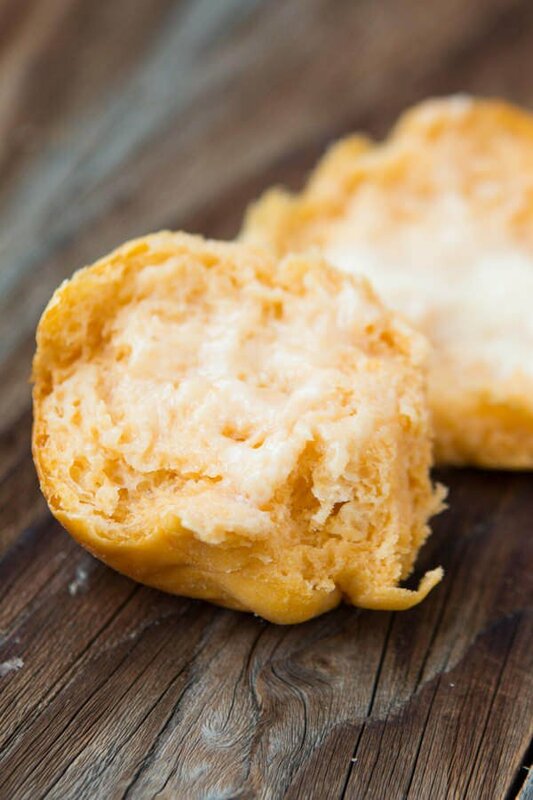 Cut about 2″ pieces and using the palm of your hand, gently roll the dough into balls. 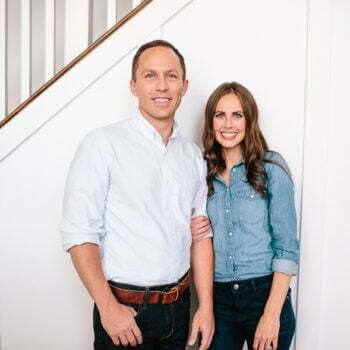 Watch the video in the post for additional help. Place on a greased cookie sheet and cover with another towel or saran wrap. Allow to rise for 1-2 hours. Heat the oven to 350 degrees and bake for 18-20 minutes then quickly brush the tops with more butter and serve. Love making bread, rolls or anything with yeast! These are definitely being made on my next baking day. Why does the vital wheat gluten have to be added so it doesn’t touch the salt? I use VWG all the time and wondered why this stipulation? The salt can make the VWG less effective. I hope you enjoy these! We would love to hear what you think! Will pureeing the sweet potatoes make them any less amazing? I confused 2 recipes and accidentally pureed mine instead of smashing them! I am worried that they may not turn out as well. I made these last Thanksgiving and they were AMAZING! My family has been requesting them ever since! Last year I did not host the holiday but I am this year. 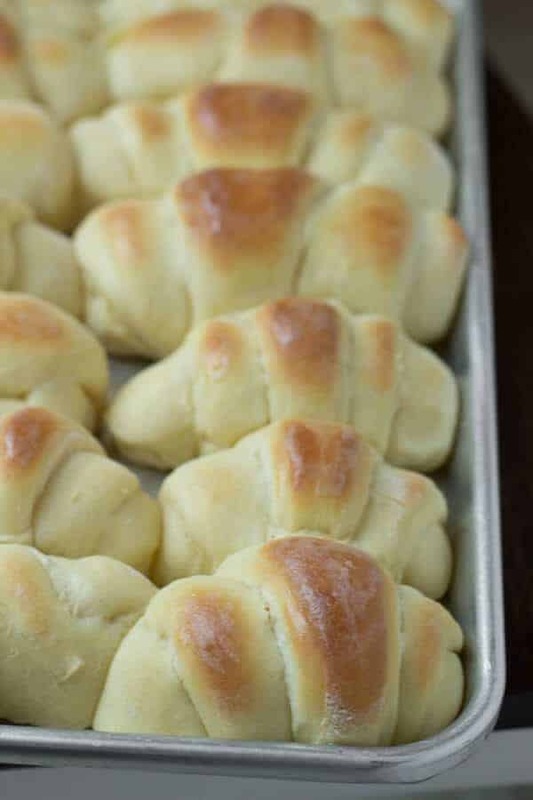 I want to surprise them with these rolls but will not have time to make them on Thanksgiving morning with all the other prepping / cooking going on. Do you think they would be as good if I made them the day before and gently reheated them in the oven the next day? What would be the best way to reheat them? I want them to be soft and not “toasted”. In a pan covered with tinfoil on low heat? Seriously: best rolls ever! I just made them because my daughter asked for them; they are so easy to make and SO FLUFFY!!! I was thinking we wouldn’t be able to eat them all and I would take them to work, but forget it! Lol. Thank you! Also, thank you for the video! I do not know what “vital wheat gluten” is … Is it in the baking (flour, sugar, etc aisle), in a jar/bottle? Or is it something I have to find at a specialty store, if so what kind of store? Thank You! Hi Leslie, if all else fails you can skip it and just stir the dough with a wooden spoon versus the kitchenaid just to keep them extra fluffy. Generally it’s in the baking aisle by the yeast, and most specialty store like Good Earth or Whole Foods tend to carry it as well. I saw several people ask about bread machines above, so I thought that I would let you know that I have used this recipe in a bread machine on the dough setting a couple of times and it turns out great (I have never actually baked it in the machine because I have a 2 year old who likes to hold rolls in his hand, but I don’t see why it wouldn’t be fine). I also used honey instead of sugar, coconut oil instead of butter, and purple sweet potatoes instead of orange because those are what was in my cupboard at the time, and they all worked great. Thanks for a wonderful recipe – a go to family fave in our house! Your recipes never disappoint! This is definitely no exception. I made these rolls for company a few days ago and they were amazing! Light and fluffy, and such a beautiful color! Delicious all the way around. I tried to follow the recipe exactly, but my 2 year old LOVES to help me bake, so he was standing next to me and decided to add an extra tablespoon or so of sugar! Haha I can’t imagine it made a huge difference. Anyway, this is now my go-to dinner roll recipe! Plus they’re delicious toasted with jelly the next day! Oh I am so glad to hear that!! I agree, the color really does end up so pretty, right? Thanks Rebecca! Could you substitute pumpkin for the sweet potatoes? I was wondering if you could make them in a bread machine? also wondering if I took half the bread flour and replaced it with cake flour? did like half cake flour half bread flour? I am out of all purpose flour atm that’s the only two flours I have in my house atm. Just wondering, what type of sweet potato did you use? I live in Asia and we typically have three types of sweet potato, the purple (yam), yellow and orange one. I’m not quite sure which one you used in this recipe and I wonder if the type of sweet potato will affect the end result. Thanks for the great recipe! Thank you for checking, it’s an orange sweet potato. 🙂 I’d be curious how the purple would turn out though. Wish I had some to experiment with! Oh awesome! Cannot wait to try that plus the color must be awesome! Well, I hate being one of those cooks who changed things, but I used what I had. Outcome: Awesome! Some changes: Used almond milk, regular white flour and about 1/3 King Arthur Whole Wheat White, thru all other ingredients unchanged in a bowl and mixed it up. Kneaded a few minutes on the counter (no machines) then put in the fridge overnight to rise. The next AM I rolled them out (net was 16 rolls) and they were wetter than normal dough, but that was OK. I then baked at 390 for 7 minutes. They are heaven! I bake a lot, always trying new (easy) things and this gave me the perfect “puffy bun” we like around here. They should make pillows with these…. haha, yes they should make pillows with this. Now that’s my kind of sleep! Glad the changes worked out! Hello. I’m making these rolls now. Question. When mixing in the mixer with dough hook, should these end up as a big dough-ball? I ask because the 2 3/4 cup of flour with the other ingredients definitely does not make a dough ball? I added a couple TBL more flour, but still no dough ball…Can you clarify please? Also, if it is not supposed to form a normal bread doughball when mixing, you might want to add that to your instructions for anyone else who is curious. Thanks!!! We’re egg free in our home so I replaced the egg with 1 flaxseed egg (1 tbs flaxseed meal mixed with 2.5 to 3 tbs warm water and self to soak into a gel for 5 mins). Just so good! Thank you! I didn’t even know you could do that and have rolls turn out! I’m so glad you commented! I have a “thing” about touching dough–nuts I know. I love “Mississippi Reds” potatoes and real cows butter or red eye gravy. I’m bound and determined to hold my breath and make these rolls. I hope you love them and I’ve totally heard that people don’t like touching food. Whole wheat flour will always provide a more dense bread. Most whole wheat breads actually just use a portion of whole wheat flour and the rest white flour. You can play around with the measurements. Also, adding soy lecithin will help to soften things up. I made these last night-they were delicious! I’ve never made yeast rolls of any kind so I was a bit nervous, but your recipe was easy to follow and the video on how to form the rolls helped tremendously! Thanks for a great recipe-I’ll definitely make them again and again! Oh yay!! I’m so glad that you gave them a go, Kendall. You’ll have to try our potato rolls next! I made these tonight and they were great!!!! Do you think the S P rolls can be made one day ahead and stored in plastic bags .let me know ASAP. No – you can’t make them a day early unless you coat them with a little gasoline first and cover them with an oily rag. I guess there are such things as a stupid question. Sorry to ask a dumb question, but I don’t think I’ve seen “bread flour” in baking section before. Any help? I see cake flour and all purpose. And I have another question about the egg. I noticed the “1/2 T white removed,” is that just to adjust the amount of egg, or is the white used later to brush the tops or something? Forgive me if I missed this in the instructions. Another rising tip for the sake of general sharing… I like to use my dryer! I run it on full heat for about 5 minutes (empty), then slip my pan of bread in and close the door. Nice warm environment! That’s a great tip! If they are frozen it could take 4-6 hours depending on how warm your house is, but the fridge should only be an hour or two. The egg white adjustment was to change the amount of egg, but you could always whisk that up and brush it on top or not! I’d never made bread before and my first attempt at these turned out ridiculously perfect and amazing. Thanks for the recipe. 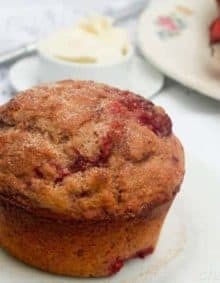 Has anyone tried making it with spelt flour? That is awesome!! I’m so happy to hear that! Oh my, these look wonderful, and if they tastes half as great, it will be sure winner. Thanks for an entertaining easy to follow recipe! We like to use a stick of butter as well. Not sure why it makes a difference but it does seem to! Did you really get 30 rolls out of this recipe or did I miss something? Just depends on how big you make them. How big did you make them? Last recipe I rolled about 12 rolls that were about 1/2 the size of my fist. Is it sweet potato or yam? Hi! These look amazing. I already read in the comments that I can skip the active wheat gluten so I will probably try it that way, but I am wondering how you prepped the sweet potato. Wrap it in foil and bake at 350 till it’s soft? And is that something that can be done ahead of time? Like have you tried baking several and then freezing them in 1-cup quantities to be thawed for use in these rolls. Sweet Basil where do I buy wheat gluten? All of our stores here in Utah carry it in the baking section under brands like, Hodgson Mill, Bob’s Red Mill etc. Outside of Utah you’ll have to check around. Health food or more natural stores sell it or amazon.com. i made these but I didn’t get much of a rise before and after shaping them into balls. When I baked them they were small. Any suggestions? Was your house at all chilly? Rolls love a warm home so I tend to heat the oven to 200 then leave it on for 15 minutes. Turn it off and open the door then put the rolls next to it on the counter. Was your yeast good and did it proof well? Did the yeast come in contact with salt directly? Are you meaning yam instead of sweet potato? The color of the rolls look more like yam color. Just wanted to make sure I buy the right kind! looks wonderful. Would I be able to give these as a gift without cooking them? Could they be refrigerated after they rise? For how long? Thanks! 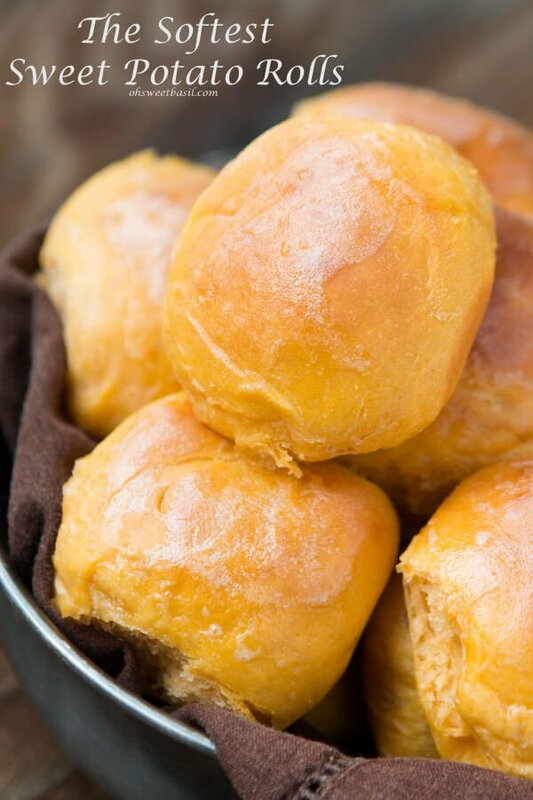 I’ve made rolls with sweet potato and pumpkin before and I love the texture and flavor and yours seriously look like the softest & fluffiest rolls EVER!! Want.Wow. Pinned! Thank you so much for letting us know! Enjoy! 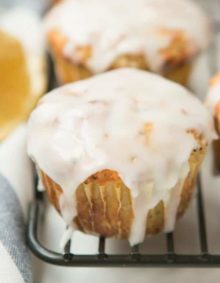 is there a way to make them without using yeast? I am Celiac, but these looked so good I read the recipe and decided to use my gluten free bread flour and follow the directions you had with out the wheat gluten of course, and they turned out delicious. So soft, not crumbly like most other gf breads that are so course and no flavor. 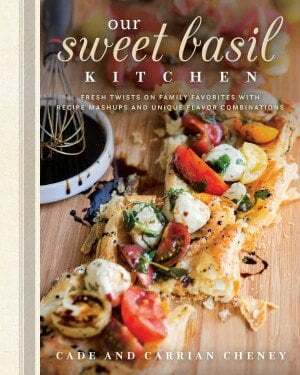 Love this idea of using sweet potatoes as they are my favorite. Thanx!! That’s so awesome, Chris!!! Thank you so much for taking the time to comment! Is the yeast like the little balls of dried yeast or is it Surebake…? I don’t have a stand mixer. Can you make these mixing by hand? If so can you give some directions? Have you tried them with whole wheat flour ? These are fabulous! I think these are perfect for my Thanksgiving table! I just want to sink my teeth into them. Pinned! Oh my goodness. I’m definitely going to try these for Thanksgiving dinner with a pat of honey cinnamon butter. YUM! I hope you do! We devoured them! 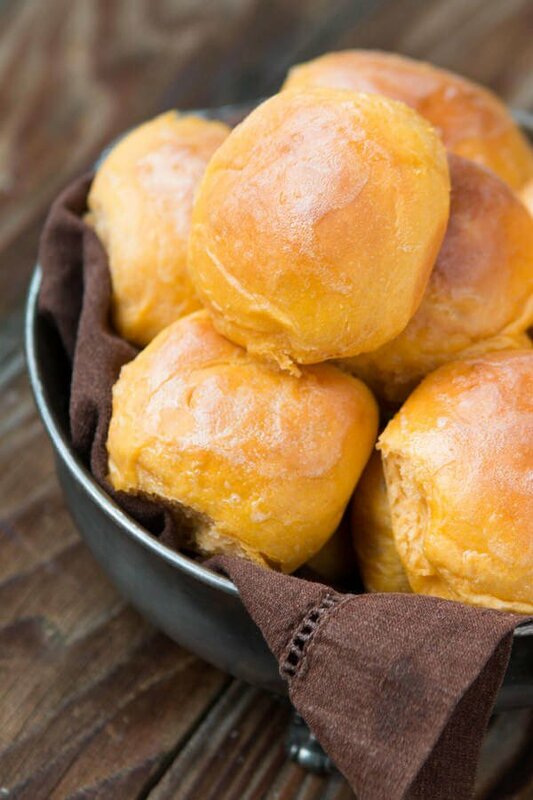 I’ve never heard of sweet potato rolls before, but these look incredible! Your pictures are making me so hungry right now. I hadn’t either, but the experiment worked and now I am making them all the time! Have you ever tried to make these as a loaf of bread in a bread machine? I haven’t as we don’t have a bread machine, but I’d love to hear how it turns out! Stumbled upon your blog today & boy was I happy that I did! 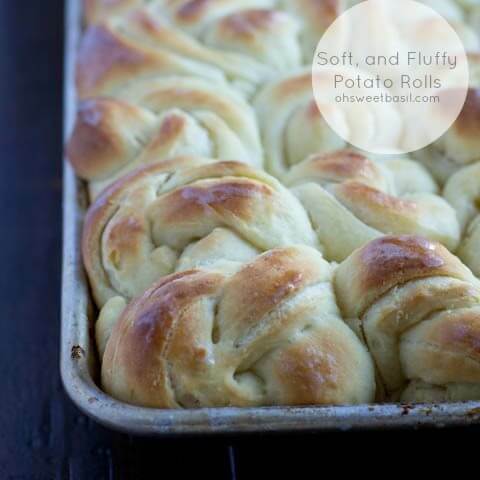 Can’t wait to make these rolls, which would be a perfect pairing with my Zuppa Toscana Soup. Already browsing your recipe collection for future ideas. What better timing to bake these fluffy pillows of deliciousness now that Fall coming to an end and Winter is knocking our door? Ohhhh, I need to make Zuppa Toscana too! These look great! Can they be made without the wheat gluten? Hi Nichole, You definitely can skip the vital wheat gluten, there wont be much of a difference. These sound so yummy! Have you ever tried making them with an egg replacer? DO you think it would work? Have an egg allergic child that I am sure would love them too. I haven’t tried that. You’ll have to let me know if it works! Homemade rolls are the best! I’ve never tried these. They look so good! These rolls look so yummy!!! Oh…my! Now these are my kind of rolls! Would be perfect for Thanksgiving or anytime! Can’t wait to try them soon. 🙂 Pinned them to try later. 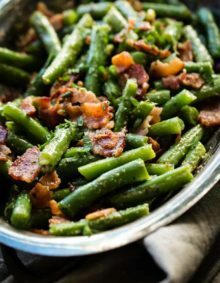 Oh, I am definitely pinning these to make this later this week with dinner! Sweet taters are one of my favorite things..so when you bake them for more carby goodness, well, HOLY YUM. Pinned! haha! Oh, man we are hilarious!